Swimming with sea turtles, eagle rays and barracudas can be so fascinating that a diver might forget about time, so it’s a good idea to take a watch with you as well as a dive computer. We took two divers’ watches with us when we went diving off Tenerife, in the Canary Islands: the new IWC Aquatimer Automatic, the basic model in the Aquatimer family that IWC updated in 2014, and the Tudor Pelagos, the professional divers’ watch introduced in 2012 by Rolex’s sister brand. 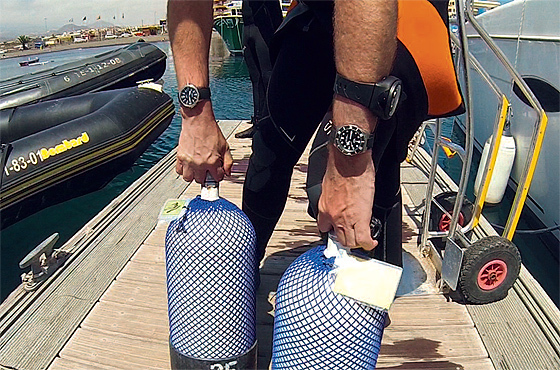 We tested the watches on several dives and also examined them on land. Our first dive wasn’t very deep: we simply wanted to do a little fish watching. We checked and donned our equipment, rechecked the pressure in our air tanks, and fell backwards into the water. To monitor our dive time, we turned the index on each watch’s dive-time scale until it was tangent to the tip of the minutes hand. 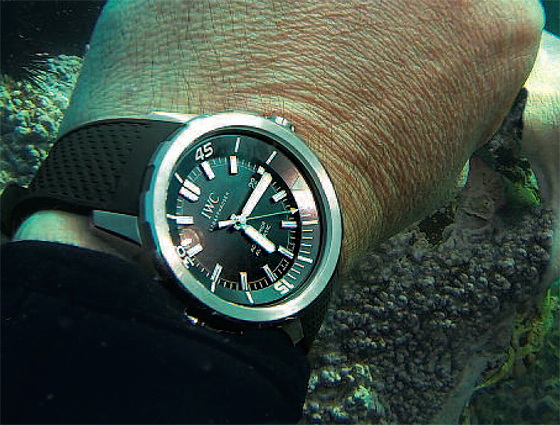 The IWC Aquatimer has a newly developed SafeDive bezel system that we found very user-friendly. The outer rotatable bezel turns another ring, safely positioned under the crystal and surrounding the dial, on which the dive time is shown. The bezel can be rotated in both directions, but for safety, the inner scale moves only when the bezel is turned counterclockwise. The scale remains motionless when the bezel is turned the other way. This ensures that a diver won’t shorten the indicated dive time if he happens to snag his wrist on a submerged rock, which could cause him to skip a crucial decompression stop. The system also has another advantage: the crystal protects the scale and its luminous coating against scratches and saltwater. And we found this system easier to use than a watch with an inner scale that’s operated with a second crown. 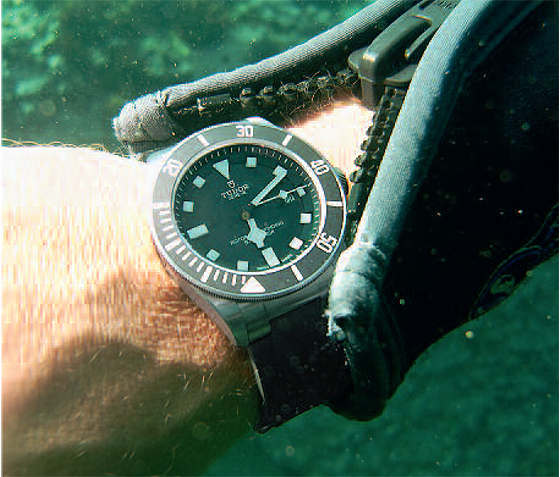 Tudor’s unidirectional rotating diving bezel also works impeccably. Narrow fluting makes this component even easier to grasp than IWC’s. As on the Aquatimer, the Tudor’s rotatable bezel clicks into place in single-minute increments. The matte scale is crafted from a ceramic material that doesn’t give scratches a chance. But the luminous coating on the scale is rather soft and could become scratched over the long term. "Both manufacturers have added some texture to the inner surface of each strap to reduce perspiration in hot weather." We began our descent and encountered our first school of gilthead seabream. We continued down to the seafloor and found two rays, moray eels and a seahorse. It would be easy to lose track of time, but our underwater regimen includes regularly glancing at our pressure gauge, which shows how much pressurized air remains in our tanks, and at our watch, where we can check the dive time. After 40 minutes, the pressure gauge reminded us to begin our ascent to the surface. A problem cropped up during our first dive: both watches’ straps were too short to fit comfortably over the sleeves of our 7-mm-thick diving suits. The Tudor’s rubber strap has a divers’ extension built into the clasp that looks like a little belt, but this didn’t work for us: the extended strap fit too loosely, even on its smallest setting. We had no choice but to partially unzip the zippers on the sleeves of our diving suits and wear both watches around our bare wrists. In all other aspects, the rubber straps and pin buckles worked well on both watches. They have different decorative patterns but are equally well crafted. Both manufacturers have added some texture to the inner surface of each strap to reduce perspiration in hot weather. Both clasps are neatly crafted and each has a milled pin, although IWC’s polished edges show a bit more time spent on fabrication.